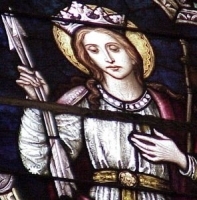 Legendary princess, the daughter of a Christian British king and Saint Daria. She travelled Europe in company of either 11 or 11,000 fellow maidens; the 11,000 number probably resulted from a misreading of the term "11M" which indicated 11 Martyrs, but which a copyist took for a Roman numeral. Ursula and her company were tortured to death to get them to renounce their faith, and old paintings of them show many of the women being killed in various painful ways. Namesake for the Ursuline Order, founded for the education of young Catholic girls and women. Son of Archduke Otto and Princess Maria Josephine of Saxony; great-nephew of Emperor Francis Joseph I. A stigmatic nun prophesied that he would be the victim of attacks and great suffering. A group of people were specifically assigned to pray for him at all times; after his death this group formed the League of Prayer of the Emperor Charles for the Peace of the Peoples (Gebetsliga Kaiser Karl für den Völkerfrieden), which became an ecclesiastically recognized prayer group in 1963. He received a strong Catholic education, and developed a strong devotion to the Holy Eucharist and the Sacred Heart of Jesus. Married Princess Zita of Bourbon and Parma on 21 October 1911. They had eight children over the next ten years. With the assassination of Archduke Francis Ferdinand on 28 June 1914, the trigger for World War I, Charles became heir presumptive to the throne of the Austro-Hungarian Empire. On the death of Emperor Francis Joseph on 21 November 1916, Charles became Emperor of Austria; crowned apostolic king of Hungary on 30 December 1916. He saw his crown as a way to implement Christian charity and social reform. He worked for peace, for an end to the war, and was the only leader to support Pope Benedict XV's peace effort. After the war, Charles was exiled to Switzerland in March 1919. Trying to prevent the rise of Communism in Central Europe, he tried twice in 1921 to return to power, but since he refused to be the cause of civil war, he finally gave up. Since he considered his office a mandate from God, he never abdicated his throne or title, but he was exiled to the island of Madeira, Portugal and spent his remaining days in prayerful poverty. His widow, princess Zita, dressed in black and lived in mourning her remaining 67 years. Son of Carmelo and Giuseppa Fana Puglisi, a cobbler and a seamstress. Ordained on 2 July 1960 as a priest in the archdiocese of Palermo, Italy. Parish priest in the areas of Settacannoli, Romagnolo, Vadessi, Godrano and Brancaccio in Italy. 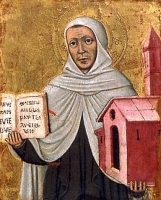 Confessor of the Basilian sisters Figlie di Santa Macrina. Taught at a number of schools from 1962 to 1993. Worked with youth in the poorest areas of his assignments, and helped teach anyone who would listen about the reforms of Vatican II that were designed to revilatize the involvement of the laity. Worked in Godrano to end bloody vendettas, and reconciled families broken by violence. Member of the Presenza del Vangelo. Vice-rector of the seminary in Palermo on 9 August 1978; director of diocesan vocations on 24 November 1979 and of the region on 5 February 1986. The work he did in schools, with vocations and in the neighborhoods proved a model for later teachers who work from the Christian point of view. Worked with groups of nuns, priests and lay people to improve living conditions and to denouce crime and the collusion of elected officials with organized crime. He received a series of threats, and was murdered at home by the mafia for his work. Martyr. Prince of Scotland, the son of King Forchado and Queen Irelina. Educated by the local bishop, Wendelin decided to abandon life in the royal family, and devote himself to God. Dressed as a pilgrim, Wendelin left his castle home in the middle of the night, and left the worldly life behind. Pilgrim to many holy sites, reaching Rome, Italy in 574. During an audience with Pope Benedict I, the pope told him to follow his desire for a life with God. Lived for a while in Einsidel, Germany. Hermit in the forest wilderness of Westerich. During a trip to the shrines in Trier, Germany, he reportedly met a wealthy highwayman. The thief admonished Wendelin for begging when he was so obviously capable of earning his living. He then worked for the thief as a swineherd until he found there was no time for his prayers. He transferred to work tending cattle, Wendelin again had time for prayer. However, the herd he tended grew so fast that he soon found himself again over-worked. This time he was transferred to tending sheep, traditionally a job for children or older men as it was less physically demanding. Even when his flock grew large, he still had time for prayer. Legend says that God transferred Wendelin and his flocks back to the old hermitage many times, and then brought them back in the evening. 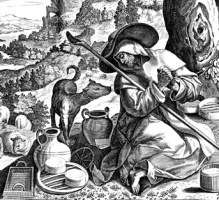 Hermit near Trier in 590. Abbot in Tholey, Germany in 597. Educated at the Holy Spirit School in Amalfi, Colombia, and in Medellín, Colombia. Teacher. Beginning in 1908, she worked as missionary to the natives in the Uraba and Sarare regions. Founded the Works of the Indians and the Congregation of Missionary Sisters of Immaculate Mary and of Saint Catherine of Siena who minister to the poor throughout South America. Known for her defense of Indian rights, and as a strong role model for South American girls. Only child of a farming family. Worked as a shepherd, spending his time in the field in prayer. His family hoped he would marry, but Malchus felt a call to the religious life and slipped away from home and became a monk; he lived as a vegetarian, eating only dates, cheese and milk. When Malchus' father died, he left the monastery against his abbot's orders to return home and help his family. On the road he and a group of pilgrims were kidnapped by Saracen raiders and sold into slavery. He was forced to marry another slave, but converted her to Christianity, and the two lived as brother and sister. They eventually escaped, returning to Malchus' old monastery where they lived the religious life; Malchus was often called on to tell his story as a lesson about disobeying your abbot. Legend says that while they were on the road to the monastery, the escaped slaves were protected by a lion. Member of the noble Ui Neill clan. Monk and spiritual student of Saint Columba and Saint Seenell at Cluain Inis, Ireland for 18 years. He moved to Iona Abbey in Scotland, but found Saint Columba had left a prophecy that Finian was to be turned away as he was destined to found another house. Founded Taghmon (Tech Munnu) monastery, County Wexford, Ireland, and served as its first abbot. Attended the Magh Lene Synod in 630 where he defended Celtic liturgical practices against the Latin. In his later years he was afflicted with a terrible skin disease, possibly a form of leprosy, and was known for the patient, uncomplaining way he bore it. There are several churches in Scotland that have his name, possibly because of the evangelization work by the monks his house who thought so highly of him. Joined the reformed Dominican priory of Cortona, Italy at age 15. Ordained in Cortona. Known for his deep life of prayer, penance and contemplation. Noted preacher, often on the theme of contemplating your own death, preaching with a skull in his hand. Raised in a pagan family. Converted to Christianity while studying at Alexandria, Egypt as a teenager. Studied with Saint Anthony the Great in the Egyptian desert in 306. He then gave away his wealth, and introduced the eremitical life in the Gaza region of Palestine. Supported himself by weaving baskets. Founded several monasteries in Palestine. Noted for his ascetic life; for years he ate but 15 figs a day. Miracle worker whose fame attracted unwanted crowds; to escape the people, including his most dedicated student Saint Hesychius, the notoriety, and the persecutions of Julian the Apsotate, he lived on Mount Sinai, in Egypt, in Sicily, in Dalmatia, on Paphos, and Cyprus. Born to the nobility, she was drawn to religious life; this desire was intensified when she met Saint Genevieve. Her fiance opposed the choice. Celina fled to the local cathedral with Saint Genevieve; its doors opened to admit them, closed behind them, and could not be opened again until the fiance and Celina's family agreed to her choice. She spent the rest of her life as a prayerful nun devoted to works of charity. Imprisoned, tortured and martyred at the age of 13 for his faith. Monk. Bishop of the Moglena region of western Macedonia. Fought the heresies Manichaeism and Messalianism. Born a prince, the fourth son of Blessed James I, King of Aragon. Turning from worldly ways, he joined the Mercedarians, receiving the habit from Saint Peter Nolasco. Archbishop of Toledo, Spain. 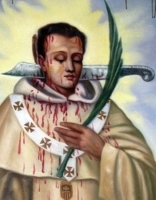 Saracens cut off his hand with the ring of his office, and then martyred him for not losing his faith. Lector and catechist at the cathedral of Lyons, France. Spiritual student of and assistant to Saint Justus of Lyons. Hermit in the deserts near Alexandria, Egypt from 381 until his death. Born to Anglo-Saxon parents who had fled England at the Norman Conquest of 1066. Saintly lay brother at the monastery of Saint Alexander. Priest under Pope Callistus, whom he secretly buried, and for which act he was killed by order of Emperor Alexander Severus. Martyr. One of a group of 15 Christian soldiers who were tortured and martyred in the persecutions of Diocletian. Hermit at Fontaine-de-Saint-Valéry, France. Monk at Fontenelle Abbey. Evangelist who worked from an island in the Seine near Caudebec. Benedictine monk at Monte Cassino in 1076. Spiritual student of Saint Desiderius who was later Pope Victor III. Sent to Croatia by Pope Saint Gregory VII to crown King Zwoinimir. Cistercian Benedictine nun. Abbess at Salzinnes, Namur, France. Abbess at Flines, diocese of Cambrai, France. Fourth-century hermit, monk and abbot in the Egyptian desert. He was one of the leaders in the early monastic movement. Blind. Mother of Saint Principius of Soissons and Saint Remigius of Rheims. Benedictine monk. Abbot of Ambronay Abbey, diocese of Belley, France. Abbot of Saint Victor Abbey at Marseilles, France. Bishop of Marseilles c.767. Bishop of Bordeaux, France c.405. Monk in Ireland. Bishop of Lindisfarne, England.